There are a number of texts in the medieval Latin manuscripts which the copyist attributes to “Effrem” etc. The Clavis Patrum Latinorum divides these into two groups; “Ephraem Latinus” and “Pseudo-Ephraem Latinus”. Neither has any connection with Ephraem the Syrian, of course. The “genuine” Ephraim Latinus consists of texts which are translations into Latin of texts in the “Ephraim Graecus” collection. The pseudo-Ephraim Latinus texts are Latin original compositions, although they may also draw on the Greek materials. Here I want to talk about Ephraim Latinus. This also falls into two groups; a collection of 7 sermons, and a couple of other texts. In the medieval Latin manuscripts, we find a small collection of sermons attributed to “Ephraem Diaconus Edesseni”, i.e. Ephraim the deacon, of Edessa. This is identified in the Clavis Patrum Latinorum as CPL 1143.
i. De die iudicii et de resurrectione. (Cf. CPG 4080) MMP page. ii. De beatitudine animae. (cf. 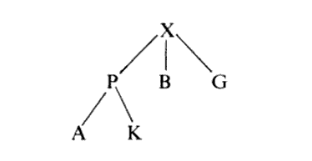 CPG 3935, 2a) MMP page. iii. De patientia, sometimes De paenitentia (cf. CPG 3915) MMP page. v. De die iudicii. (CPG 3940, 4089) MMP page. vi. De compunctione cordis. (CPG 3909, 3968). This is in fact two texts rolled up under the title of the second. The first is actually “Institutio data ad monachos”. MMP page. In Hemmerginer-Iliadou col. 816, we get this list of manuscripts of the collection. Ms. Vatican lat. 671. Online here. Staatsbibliothek zu Berlin, Ms. theol. lat. fol. 355 (once 307) 9th c.
Laon (Laudunensis), Ms. 121. 9th c.
St Omer (Audomarensis) 33bis 8th c. Online here. Paris Lat. 12634. 7-8th c. De compunctione is split into two, the first called Institutio data ad monachos. The most ancient witness to this book 1 seems to be a dismembered ms of the second half of the 7th c., forming guard-leaves for Paris lat. 10399 and Ambianensis 12. Here are a few manuscripts, found online, more or less at random. BSB Clm 14364 (9th c.) ff.7r-87r contains the full set; De iudicio domini et resurrectione, de regno caelorum et munditia animae; De Beatitudine animae; De paenitentia; De luctaminibus; De die iudicii; De compunctione cordis. Ms. Bodleian 63 (link only to catalogue) contains them. BSB Clm 3516 (9th c.) contains the Sermo in Joseph (see below). Assemani used Ms. Vatican 5051, fol. 90 f. and a “Cod. Casanatensis”, i.e. from the Biblioteca Casanatense in Rome. These correspond to sermons 5, 6, 1-2, 4, 3 and 7 above. English translation of De paenitentia by T.S.Pattie, “Ephraem the Syrian and the Latin manuscripts of De Paenitentia”, in: British Library Journal 13 (1987), p.1-24. Online here. S. Assemani vol. 3, 553-560 and 579-581 (PDF p.629-636; 654-657 ) Note that the incipit of the last work is different, owing to lacunae in the manuscripts that he used. Hemmerdinger-Iliadou, DSp. IV, col. 815 f.
Sermo in pulcherimum Ioseph. Incipit: “Deus Abraham, Deus Isaac, Deus Iacob, benedicte Deus » (CPG 3938). Published by Laurent Bailly, “ Une traduction latine d’un sermon d’Ephrem dans le Clm 3516”, in : Sacris Erudiri 21 (NOT 20 as per CPL) (1972-3) p.71-80. First page here. The sermon corresponds to Assemani vol. 2, p.21-29c. Clm = Codex latinus monacensis. There is a translation of the Greek by Ephrem Lash. De sermone adversus improbas mulieris de decollatione Sancti Ioannis Baptistae. Inc: “Heu me, quid agam? Unde sermonis exordium” ( = CPG 4001). Cf. CPL 931, 935. = CPL 931, ps.Chrysostom Sermo de decollatione Sancti Ioannis Baptistae. Printed in PL 95 : 1508-1514. CPL 935 is also referenced, for no obvious reason. Found in ms 238, fol. 1. according to the Eichstatt catalogue. That’s what I have! It would be good to transcribe the Latin texts, say from Assemani for most of them, and direct from manuscript for De compunctione. Sadly I lack the time to do this at the moment. There is a Latin text from the early Dark Ages which some believe teaches the “Rapture”; the idea that, before the Tribulation described in Revelation, the saints will all be caught up in the air by God and taken away. This claim has become a subject of controversy in the USA, as has the discussion about the Latin text. I don’t intend to discuss here the Rapture teaching. But I think that it would be interesting to look at this obscure text here, and verify the claim made about it. Will the text bear the weight placed upon it? Also, since many of the manuscripts are online, we get to look at two critical texts and three manuscripts, and second-guess the editors! But I do apologise for its length! I suspect this post might interest people involved in that controversy, so I have tried to avoid jargon and explain my terms, so that any interested reader can follow the discussion. If I have failed at any point, please let me know through the comments. First, some bibliography. It’s as well to be clear that there is a Syriac “Apocalypse of pseudo-Ephrem” which is NOT the same work; and there are a lot of Greek sermons attributed to Ephraim, all about the end of the world! 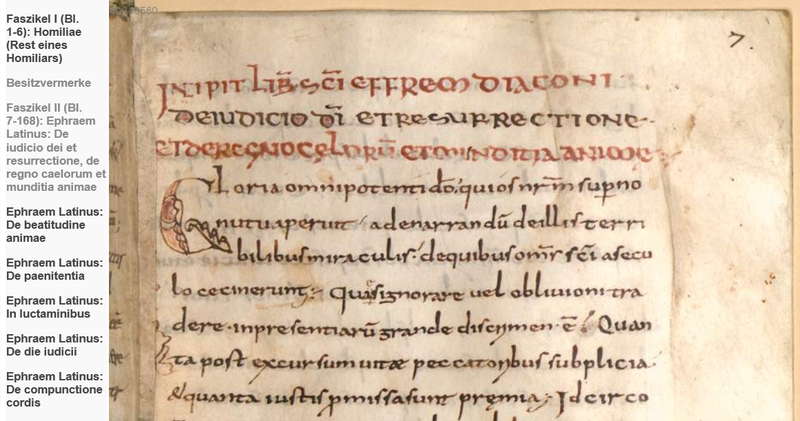 In the Clavis Patrum Latinorum, the index of early Christian texts in Latin, this text is CPL 1144, and given the title “Scarpsum de dictis Sancti Efrem prope fine mundi et consummatione saeculi et conturbatione gentium”, i.e. “Extract from the sayings of St Ephraim On the end of the world, the consummation of the age, and the confusion of the nations.” It is generally known for convenience as “De fine mundi”, “On the end of the world”. The title as given in the earliest known copies is given below. However I notice that in some scholarship the work is listed as “De antichristo et de fine mundi”, “On antichrist and the end of the world”. Ephraim the Syrian lived from 306 to 373 AD. He wrote only in Syriac. He has nothing to do with this work. But his fame was such that works under his name appear in every single language of the ancient world. A very large collection of works in Greek can be found in the handwritten Greek books of the middle ages, where the title says that the author is Ephraim. Very few of these are in fact translations of his works, or even from works by other people in Syriac. Most of these works are of unknown authorship. These works are known for convenience as “Ephraim Graecus”. They have mostly been printed. Translations into English or French etc are few. Scholars have not worked here, for the most part. There is also a small collection of works in Latin under the name of Ephraim in the Latin manuscripts. These are known for convenience to scholars as “Ephraim Latinus”. A collection of 6 sermons seems to be a translation of works from Ephraim Graecus. The other Ephraim Latinus texts are known as “Pseudo Ephraim Latinus”. Much of this material has never been printed. Studies by scholars are few. The author of our work, “De fine mundi”, will be referred to (for convenience – what else?) as pseudo-Ephraim Latinus. We shall see what we can deduce about him later on. This text has reached us in a small number of handwritten medieval copies, today preserved in libraries in cities across Europe. Each manuscript is unique, and each library assigns each a code or number of some sort (known as a shelfmark). Editors give each manuscript a single letter reference (or siglum) for quick reference by scholars. P = Paris, Bibliothèque Nationale Français, manuscript Latin 13348. Text starts on folio (in manuscript studies each leaf is numbered, rather than each page, and the front side is the “recto” or “r”; the reverse is the “verso” or “v”) 89v and ends on 93v. Followed by a short piece from Greek of Peter the Monk, then a sermon of pseudo-Methodius. The title in the manuscript is “Scarpsum de dictis Sancti Efrem prope fine mundi et consummatione saeculi et conturbatione gentium”. The type of book-hand used tells us that the manuscript was written in the 8th century. A monochrome PDF is online here. A = Paris, Bibliothèque Sainte-Geneviève, ms. 80. Fol. 103r-104v. Then a bit of Jerome on the works of Methodius, the preface of Peter the Monk, and ps.Methodius. Same title as P. 13th century. B = Vatican, Barberini lat. 671. Foll.167-171. Followed by ps.Methodius. Same title as P. No later than 13th century. Online here. G = St Gall, Stiftsbibliothek, ms. 108. Foll.2-10. “Sermo Isidori de fine mundi” – the author of the text is given here as Isidore, not Ephraim. The next text in the ms. is the Revelation of Ps.Methodius. About 800 AD. Online here. K = Karlsruhe, Landesbibliothek, ms. 196. Text starts on folio 24r, ends 29r. “Sermo sancti Effrem de finibus seculi” (Sermon of St Ephraim on the ends of the ages). Next but one text is the Revelation of Ps. Methodius. 9th century. This list is from Verhelst’s edition. A Google search suggested that there might be another manuscript at Koblenz as well, but the opening words of the text (the “incipit”) indicate that this is a different unknown work. X stands for the now lost original. The Latin text has been printed twice, based upon the manuscripts. P. Caspari, Briefe, Abhandlungen und Predigten aus den zwei letzten Jahrhunderten des kirchlichen Altherthums und dem Anfang des Mittelalters, 1896. Online here. Pages 208-20 contain the text (Caspari_text PDF); pages 429-472 contain Caspari’s discussion of it (Caspari_discussion PDF). D. Verhelst, “Scarpsum de dictis sancti Efrem prope fine”, in: R. Lievens (ed), Pascua Mediaevalia : studies voor Prof. Dr. J.M. de Smet, Louvain, 1983, p.518-528. Online here. Caspari edited the text based upon 4 manuscripts; Verhelst added knowledge of the Karlsruhe manuscript. The two editions differ slightly, as we shall see. Electronic transcriptions of the Rhoades translation have circulated on the internet, but these are apparently of doubtful accuracy. B. McGinn, Visions of the End: Apocalyptic Traditions in the Middle Ages, 1979. Chapter 4, pp.60-1, contains a translation of part of the work from Caspari. Quite a few papers mention this work. Here’s a selection of those not included in the footnotes. Paul J. Alexander, The Byzantine Apocalyptic Tradition, Berkeley: University of California Press, 1985, p.136 ff. The discussion that started it all, when Grant Jeffrey read it. Preview here. T.L.Frazier, A Second Look at the Second Coming: Sorting Through the Speculations, p.181. This is the anti-Rapture position with discussion of de fine mundi. Preview here. Gerrit Reinink, “Pseudo-Methodius and the Pseudo-Ephremian ‘Sermo de Fine Mundi’”, In: R.I.A. Nip &c, Media Latinitas: A collection of essays to mark the retirement of L.J.Engels, Steenbrugis, 1996, pp. 317-321. First page visible here. Unfortunately I was unable to access this paper. However I was able to access a discussion of his claim that De fine mundi is derived from the Apocalypse of ps.Methodius, in S. Shoemaker, The Apocalypse of Empire: Imperial Eschatology in Late Antiquity and Early Islam, 2018, p.202-3 n.94 f., which dismisses the claim as unconvincing. Preview here. G. Kortekaas, “The Biblical Quotations in the Pseudo-Ephremian ‘Sermo de fine mundi’”, In: R.I.A. Nip &c, Media Latinitas: A collection of essays to mark the retirement of L.J.Engels, Steenbrugis, 1996, pp. 237-244. First page visible here. Again I was unable to access this. D. Hemmerdinger-Iliadou, ‘Éphrem latin’, in: Dictionnaire de Spiritualité, vol. 4, Paris 1960, col. 815-819. R. Gryson, Répertoire général des auteurs ecclésiastiques latins de l’Antiquité et du Haut Moyen Âge, t. 1, A-H, Herder, 2007. This is said to contain an overview of the scholarship ; again I was unable to access it. Before we look at the specific passage that concerns the Rapture, in chapter 2, we ought to establish something more about the text. This is not an original composition. There is quite a quantity of works here, connected to the Second Coming of the Lord, and repentance! Nor is this all; the text is also connected to passages in the Latin Apocalypse of pseudo-Methodius, with which it is transmitted. The text really looks like something of a hodge-podge, as well it may be. Only the two works in bold relate to our passage specifically. We will ignore the remainder, except to say that they indicate that the author of this work was clearly very familiar with the Ephraim material in Greek and Latin. Caspari’s discussion included a list of places where the text was parallel to that in some other work. Here is his entry for our passage. Click on it to expand. The Latin of De fine mundi is on the left; the parallels to the right and below. Firstly, we need to recheck what De fine mundi actually says. Caspari prints his text from the Vatican manuscript. But since then we have Verhelst’s edition, and some manuscripts are actually online! Here’s the text of De fine mundi, as given by Caspari. I have placed the key words in bold. Omnes enim sancti et electi Dei, ante tribulationem quae uentura est, colliguntur et ad Dominum adsumuntur, ne quando uideant confusionem, quae uniuersum propter peccata nostra obruet mundum. For all the saints and elect of God, prior to the tribulation that is to come, are gathered and are taken [up] to the Lord, lest they see the confusion, that will overwhelm the whole world because of our sins. Omnes enim sancti et electi Dei, ante tribulationem quae uentura est, colliguntur et a Domino adsumentur, ne quando uideant confusionem, quae uniuersum propter peccata nostra obruit mundum. For all the saints and elect of God, prior to the tribulation that is to come, are gathered and will be taken by the Lord, lest they see the confusion, that will overwhelm the whole world because of our sins. 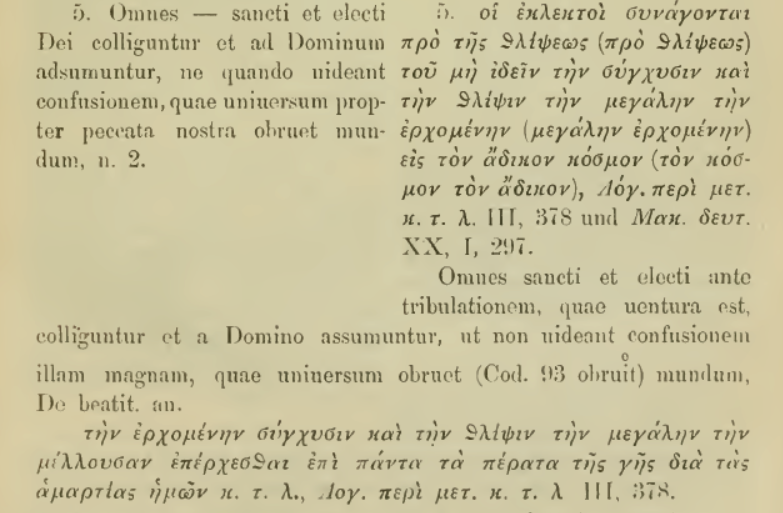 Verhelst’s apparatus shows that “ad Dominum” is just the reading of B, the Vatican manuscript, and this is online. Let’s look at it! Looking at the bottom of folio 167v we find “etaddnm” (I can’t mark the overscore on the n in this post), which is abbreviated from “et ad dominum”. Note also the spelling “adsummentur”. Here’s the same sentence in ms. P, with the same reading “a domino”. Verhelst does not indicate where he gets the “adsumentur”, but we can see it in B. However both G and P have “adsumuntur” as Caspari printed it, and this is probably right. None of this really amounts to much. It doesn’t change the meaning much, to say “taken up to God” or “taken up by God”, does it. The order in which Caspari gives his parallels is somewhat confusing. Let’s do it a bit more systematically. Omnes sancti et electi, ante tribulationem quae uentura est, collinguntur et a Domino assumuntur, ut non uideant confusionem illam magnam, quae universum obruit [obruet] mundum. All the saints and elect, before the tribulation which is to come, are gathered and taken by the Lord, so that they may not see that great confusion, that will overwhelm [overwhelms] the whole world. This is nearly identical to the passage in De fine mundi. It’s pretty obvious that our author copied it from here. This has the same reading. So there is very little doubt that the author of De fine mundi copied this word for word from De beatitudine animae. The correct readings in both texts are “a Domino” and “assumuntur” – “are gathered and taken [up] by God, so that they don’t see that great confusion, that overshadows [or “will overshadow”] the whole world”. Now let’s look at the Greek texts. Caspari really presented this data in a confusing way. I hope we can do better! I will skate lightly over the many problems that the “Ephraim Graecus” material presents to us. Οἱ ἐκλεκτοὶ συνάγονται πρὸ θλίψεως τοῦ μὴ ἰδεῖν τὴν σύγχυσιν καὶ τὴν θλῖψιν τὴν μεγάλην ἐρχομένην εἰς τὸν κόσμον τὸν ἄδικον. Electi ne videant magnam illam confusionem, atque pressuram, quae iniquum hunc mundum obruet, colliguntur. The elect are gathered together before the tribulation so that they do not see the confusion and the great suffering to come over the whole world. The sense is the same, but the “gathered and taken by the Lord” idea is reduced only to “gathered”. How being “gathered” will prevent the elect from experiencing the tribulation is not stated. At any event we can see that the translator added the “a domino assumuntur” (“taken [up] by the Lord”). Presumably this was his explanation for that very question. Had the author used “rapientur” (“will be caught up”) instead of “assumuntur” (will be taken [up]), we would have no doubt that he was thinking of this passage. But he did not. It would be interesting to know what the Old Latin was for this verse, however. 3. Λόγος περὶ μετανοίας καὶ κρίσεως, καὶ περὶ χωρισμοῦ ψυχῆς καὶ σώματος / Sermo utilis de paenitentia, et judicio, et separatione animae et corporis / Sermon on penitence, and judgement, and the separation of soul and body. When we look at the CPG for the previous item, we are informed of links to yet another Greek work. This has the code CPG 4044, and appears in Assemani volume 3, page 376. It was printed from a Vienna manuscript, no 62, folio 225 f, according to Assemani. The page of interest to us is 378 (p.454 of the downloadable PDF of Assemani). There are two sentences on this page, not together, which Caspari quotes above. The first appears at the top of Caspari, but is toward the bottom of p.378, section E, line 2. Οἱ ἐκλεκτοὶ συνάγονται πρὸ τῆς θλίψεως, τοῦ μὴ ἰδεῖν τὴν σύγχυσιν καὶ τὴν θλῖψιν τὴν μεγάλην τὴν ἐρχομένην εἰς τὸν ἄδικον κόσμον. This is pretty much identical to the passage in Beatitudines aliae. 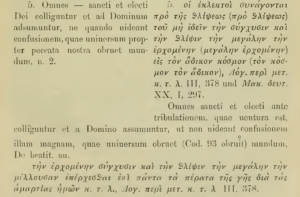 In fact the Dictionaire de spiritualite 4, col. 815, section 10, signals “duplicia” with Assemani’s “volume 1, p.294-99” – which in fact is indeed Beatitudines aliae. The second quote runs along the bottom of Caspari, but is at the top of Assemani 3 p.378, section A line 3f. I’ve highlighted Caspari’s quote. Haec expectant venturam confusionem, ac tribulationem magnam, quae ventura est super omnes terminus terrae propter peccata nostra…. This is similar material, but this doesn’t include any of the “collected together and taken by God” material. All the same, we can see quite clearly that the material in Beatitudines aliae is identical, or nearly so, to two passages in this other work in the Ephraem Graecus collection. It should be added that neither of these Greek texts is a translation of anything in Syriac. Let’s draw the threads together, after all those manuscript pictures and bits of Latin and Greek. What have we discovered here? We have discovered that in the Greek “Ephraim” material, there is a mysterious passage about the elect being gathered together before the tribulation, so that they don’t have to see the suffering. We have discovered that one of these texts was translated into Latin, becoming De beatitudine animae, and that the translator “improved” the Greek by adding a couple of words, so that the elect are gathered and, crucially, taken away by the Lord, so that they don’t see the suffering. We have discovered that the author of pseudo-Ephraim Latinus, de fine mundi, copied this sentence word-for-word from De beatitudine animae. Presumably he saw nothing unusual in it. So we have a passage, appearing in two Latin authors, which says that before the Tribulation, the elect are gathered together and taken away by the Lord. We have the same passage, less explicit, in two Greek texts from which the Latin is derived. We can see that the Latin authors understood the text in that manner. The sentence in De fine mundi is certainly copied from the Latin translation of De Beatitudine animae. The presence of “assumuntur” in the Latin, not found in the Greek, shows the author’s preference for the Latin version. Our only caveat is that we possess no critical edition of De beatitudine animae, so we cannot be sure that this wording is correct. Other parts of De fine mundi come from a range of other works by Ephraim Graecus, for which we possess no Latin translation. Unless we hypothesise the existence of now-lost Latin translations, we must presume that the author knew Greek. The Greek text of De beatitudine animae / Beatitudines aliae capita viginti contains the idea in similar wording, but without the “assumuntur” of the Latin. This work consists of 19 short blessings, and then, as chapter 20, a long section of text. It is hard not to look at the imbalance and feel that chapter 20 does not belong with the blessings; particularly when we look at the Sermo utilis de paenitentia and find the same ideas on the same page, although in two separate sentences. Chapter 20 is, perhaps, a summary of material culled from the sermo utilis? It should be added that neither Greek work was translated from Syriac, as far as we know. What about the date and place of composition? Caspari noted the reference to “Persian wars” and the decline of Rome; which places it before the Islamic conquest of Persia in 640 AD. He noted another reference to two historic “brother emperors” which are either Valens and Valentinian, ca. 378 AD; or perhaps Honorius and Arcadius, ca. 410 AD. We know that De beatitudine animae is found in a manuscript written around 700 AD. From all this, Bousset dated the work to the 4th century; Caspari to before 628. Perhaps we might speculate a little ourselves. As we have seen, the author of De fine mundi was clearly a Latin, as he copied from a form of the text only present in the Latin translation of De beatitudine animae. So this translation must already have been made. It is known that this translation was made early, not least because a manuscript exists written around 700 AD. However the author was also clearly familiar with ideas from a range of works by Ephraim Graecus, of which no Latin translations are now known to exist. If we reject the hypothesis that a lot more of Ephraim Graecus was translated into Latin in antiquity, and then lost, we must conclude that he was also fluent in Greek, and had ready access to manuscripts. We also know that he refers to the “brother emperors”. I suggest that the author was a westerner, living in Constantinople, sometime after the reign of Honorius and Arcadius – the brother emperors – and aware of the Roman collapse in the west, and of Persian attacks in the East, and in a place and time where there was intense interest in the subject of the end of the world, as might well have been the case in that period. The mass of western refugees in Constantinople at the second quarter of the 5th century fits this period nicely. On the other hand there was relatively little in the way of Persian wars until 502 AD, other than the brief wars of 421-2 and 440. There are references to the Nestorian debates in the Ephraim Graecus collection, and also to the Theotokos. Perhaps we might speculate from all this that De fine mundi was written by a Latin speaker in Constantinople around 450 AD? If this is correct, it would follow that the Ephraim Graecus material used by him existed well before this date, and the Ephraim Latinus collection of 6 sermons also. Did the author believe in the Rapture, much as modern Pre-Millenial Dispensationalists do? The cautious reader will hesitate. For we are sifting the meaning of a single sentence; and it is generally unwise to place too much reliance on a couple of words in a single sentence. There is no link to 1 Thess. 4:17, to being “caught up in the air”; only to being “taken [up]”. Really there is not. Does that by itself destroy the claim? I don’t know. What we can say that the data is consistent with Dr Jeffrey’s claim that ps.Ephraim Latinus believed in the Rapture; and indeed that the author of the Greek texts did so as well. The author states that the elect will be gathered together before the tribulation and taken away by God so that they do not see the suffering that is to come. What else, in a way, is the teaching of the Rapture than this? The text of pseudo-Ephraim Latinus’ de fine mundi will bear this interpretation. But … the statement is too brief for us to be certain. Two key words cannot compel belief. If we know of no other evidence that a modern teaching was present to the minds of 5th century believers, then we would probably be very wary of asserting it based on a single ambiguous sentence in an obscure work. The evidence, in the end, leaves us doubtful. The similarity may merely be an accident. Much more research also would be needed for us to be sure that such an interpretation was possible at that period. For any statement of this kind must be interpreted, not by the beliefs of 19th century America, but by the known beliefs of the period. We know of no other evidence that this interpretation was in vogue. Other interpretations are therefore more probable, as a commenter has already pointed out here, if they can be stated in a not-to-contrived manner. The wise man will be cautious. But such a survey is beyond the scope of this already too lengthy post. It’s certainly a very interesting text, in a neglected area of patristics. We could use much more work on Ephraim Graecus and Ephraim Latinus and pseudo-Ephraim.